Where: On any public road where it is necessary to close the road for general traffic. The temporary sign is usually displayed at road works. 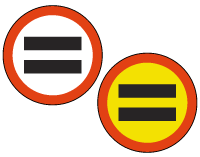 Purpose: To prohibit drivers without special authorisation from entering a certain road or section of a road. Action: Do not proceed past the sign or enter the road without special permission.